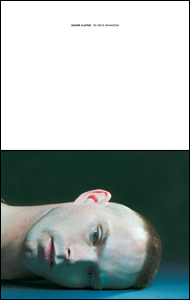 In the two series collected in the volume, Soldier/Many Wars, photographer Suzanne Opton photographs American Soldiers close up, laying their heads before the camera, and American veterans who are draped. The subjects of the Soldier series are all young, active-duty soldiers from the Iraq and Afghanistan wars, and the photographs were presented as billboards in nine American cities from 2008 through 2010. Reviewing them for The New Yorker, photography critic Vince Aletti wrote: “The posture is vulnerable and startling intimate, as if these young men and women were facing someone in bed or on a stretcher... Opton catches soldiers both on guard and off, looking out and inward simultaneously, and we can only imagine what they’re thinking, what they’ve done, and what they dread.” The project received extensive press coverage and even sparked a heated debate about America’s image of the military. The Many Wars series presents portraits of veterans from American wars over the past 70 years, most of whom are in treatment for combat trauma. Through interviews by the photographer, we learn how war has affected their lives. Both bodies of work were selected by Martin Paar for the Brighton Photo Biennial in 2010. Suzanne Opton is the recipient of a 2009 John Simon Guggenheim Fellowship. Her work has been widely exhibited in the U.S. and abroad. Her photographs are included in the permanent collections of the Brooklyn Museum; Cleveland Museum; Fotomuseum Winterthur, Zurich; Museum of Fine Arts, Houston; Musée de l’Eysée, Lausanne; and the Nelson-Atkins Museum of Art in Kansas City, among others. Phillip Prodger, Ph.D., is Curator and Head of the Photography Department at the Peabody Essex Museum in Salem, Massachusetts, which maintains one of the oldest and largest photography collections in the United States. He is the author and editor of numerous books including Time Stands Still, Darwin’s Camera, and Man Ray/Lee Miller, Partners in Surrealism. Ann Jones, journalist and photographer, is the author most recently of Kabul in Winter and War Is Not Over When It’s Over.